The abandoned West Pier strikes a forlorn and desolate note compared to its neighbour. 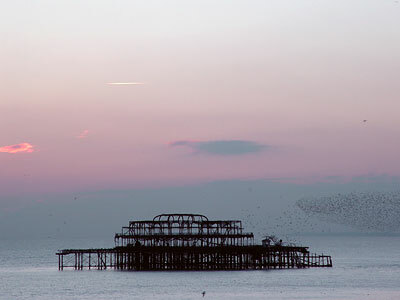 The West Pier has traditionally played host to spectacular nightly display of thousands of diving and soaring starlings, but reports suggest that they're slowly transferring their allegiance to the Palace Pier. You can just make out the starlings to the right of the pier.